Half term ended – tick. Children back at school – tick. All back from skiing holiday in one piece – tick. Relative calm and good humour resumed – tick. General irritation with British weather – high. Desire to see snow again in the next 9 months – zero. So I’ve returned from my oxymoronic non-skiing skiing holiday. The advantage of such a holiday is not to be underestimated, largely as this year I am in one piece, standing on my own two feet and not doing battle with the well-intentioned, woefully underfunded NHS. That said, to guarantee this outcome it did mean giving up an integral part of a skiing holiday, the skiing. Did I miss the skiing? Yes. If I’m honest, although I had a lovely time (largely because I had a non-skiing friend there too), there is something a bit odd about choosing to spend a week in freezing temperatures whilst not indulging in the one activity in which everyone else is indulging. With this in mind, it will come as no surprise to you that much like my faux-exercising (ie dressing up as though I am/have been exercising, remaining dressed as such all day and being mistaken for a member of the “smug women who do actually exercise every day” group), I was attired in full ski gear. Somehow I didn’t get the same satisfaction out of this duplicity as I do from my pretence at exercise. I guess that’s because those wearing ski kit were actually doing something I wanted to be doing too. So I’ve established that, for me at least, it was not a skiing holiday. Actually at the risk of being accused of pedantry, “holiday” doesn’t really cover it either. Certainly there were elements that come under the verbal umbrella of “holiday” – eating too much (not a good plan when you are not skiing to work it off, as the scales screamed at me this morning), drinking too much and laughing (a lot) with friends. However, there were also elements that transgress any trades description of “holiday”, most obviously “children”. I have long ago stopped calling going away with children a “holiday” because it simply is not a “holiday” in the sense that you might have used the word in those halcyon days of youth and no kids. No, with children, a holiday is more accurately described as a “change of scenery”. Obviously this “change of scenery” is very welcome although often more challenging than staying at home and never is this more true than on a skiing holiday. Trying to get three children (four if you count a husband) dressed in 200 layers, fed and out on the slopes before 9am requires a herculean effort. It is not possible to get through this daily trial without at least 3 missing gloves, two full-blown tantrums, serious over-heating (not surprising with thermals and 199 other layers – the timing of layering is crucial), at least 15 mentions of “you don’t know how lucky you are to be skiing at your age, we didn’t do this when I was young”, at best 2 out of the 3 children requiring a loo visit just as you are exiting (which requires removal and replacement of 200 layers X 2 to accomplish) and of course you still have the dubious pleasure of carrying all their skis to the slopes as they walk/slide/fall over alongside whining about how cold it is (whilst trying to stop yourself from shouting, “Well, what the bloody hell did you expect in a country covered in a metre of snow?). Yes, I definitely missed skiing. I hope that I shall ski again. However, there is nothing quite like the piercing blue skies in the mountains, the perfect white duvets of snow and the odd glass of wine (medicinal of course) to lift the spirits and the best thing of all, watching the children thoroughly enjoying – for the most part – an outdoor activity which doesn’t involve hours glued to a screen or tapping away on a keyboard. If you’re going to have a “change of scenery”, you can do a lot worse than the mountains – I always find the grand, awe-inspiring scale of the scenery puts everything into perspective and makes you glad to be alive! Sorry for the radio silence this week but I had a knee operation on Monday and have been extremely busy doing absolutely nothing since except periodically inspecting and admiring my surgeon’s impressive attempts at giving me back a useful knee albeit one that looks as if it has had a drawn-out battle with a potato peeler. As you know I was slightly uncomfortable about the impending forties and this is in part I think down to the three knee ops I have now had in the last year. Knee surgery is definitely one of those surgeries which reeks of age, wear and tear and threatening arthritis. Although, before you feel too sorry for me and the terrible toll the ageing process is taking on me, I should point out that I actually wrecked my knee last year whilst attempting the impossible – keeping up with my kids on the ski slopes. It should have been obvious really that I was going to struggle when their skis never deviated from pointing directly downhill whilst I took a more leisurely turning approach to my descent!). Aside from always playing catch-up, there is also the fact that when it comes to skiing, kids bounce when they fall and adults shatter. I am probably insane but I am in fact going to a ski resort with the kids in half term. I use the words “ski resort” advisedly as “skiing” would not be an accurate description of the activities I shall be indulging in – drinking and eating in alpine bars and telling anyone who will listen that I would rather stick rusty pins in my eyes than put on skis again. I have now joined that group of people – non-skiers – who desperately hark on (lie?) about how wonderful ski resorts are if you are not skiing. Of course I’ll look the part – I didn’t invest in those now ever-so-slightly tight salopettes and après-ski boots (always known as moon boots to my generation) in order to consign them to the back of the wardrobe because of a mere skiing accident that has just mildly dominated the last year for me. After all skiing is only partly about actually skiing and partly about looking the part. The writing was on the wall for me with skiing from very early on – the signs were all there if only I had taken heed. On my first ever skiing trip, in the final day race, I came a distinguished 45th…out of a field of 45. I knew then that I was no Franz Klammer. On a skiing trip in my late teens I was knocked out by a rogue button lift within my first 5 minutes on the slopes. On this occasion it wasn’t just my head that was dented but definitely my pride too – there is definitely nothing cool about being knocked sparko by an evil little button lift in front of a packed piste. This humiliation led, not surprisingly, to a voluntary retirement from the slopes until my ill-fated trip last year. Surely nothing bad could happen this time – I’d done my skiing penance hadn’t I? Oh no, those pistes were ready for one last “taking the piste” which led to me taking the not very dignified blood wagon route down the mountain and the even less dignified request for payment (extortion?) at the bottom of the mountain or risk being unceremoniously dumped to find my own way to hospital. 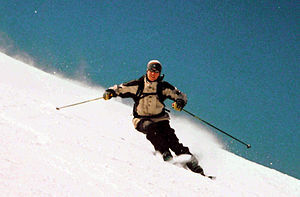 It’s funny how things turn full circle – the one thing I remember from my first ever ski trip was my instructor imploring me to “bend ze knees” – ironically 30 years on as I sit on my sofa recuperating I am still desperately trying to do the same thing. All I can do is take heart from what one blood wagon attendant said to another, under the impression (largely accurate) that my French is elementary and therefore I would be unable to understand, roughly translated, he commented that “she has kind eyes”. Who knows maybe that wasn’t exactly what he said or meant but I’ll run with it – I’d choose kind eyes over beautiful knees any day!